Senior Consultant, Obstetrics and Gynaecology Endoscopic Surgeon & Fertility Specialist Having 15 years of rich experience in the field of Obstetrics & Gynaecology. 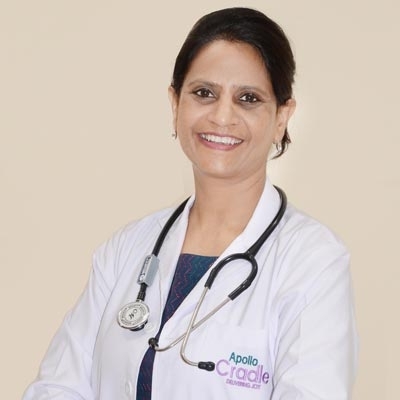 She attained proficiency and expertise in gynaecological surgeries like laparoscopic and open hysterectomy, laparoscopic & open hysterectomy, laparoscopic myomectomy, laparoscopic ovarian cystectomy and all gynaecology surgeries. Also attained experience & expertise in high risk pregnancy cases, painless normal deliveries, caesarean sections, forceps deliveries. I delivered my baby at Apollo Cradle, under the supervision of Dr. Seema Sharma. I am really lucky to have the best doctor. I also thank all the nurses and other staff for timely services. My regards to the whole team. My experience at Apollo Cradle was the best and memorable one ever. I was treated by Dr. Seema Sharma. She was very soft skilled and made me get calm during my anxious situations. I did not have any complications post-surgical. Thanks for the nurses who took special care of me. I was admitted to Apollo Cradle for delivering my baby. I was operated by Dr. Seema, she gave her best in keeping me and my baby safe. I found myself in a very safe hands and had all the hope of betterment till my discharge. Thanks to all the team. I delivered my baby at Apollo Cradle, I specially thank all the nurses and other team members from the bottom of my heart for offering me good care and services. A special thanks to Dr. Seema, for delivering my baby safely. I also enjoyed the hygienic food served there. All together had a memorable experience at Apollo Cradle, I can right away mark this as a best place for pregnancy care. I am grateful to Dr. Seema Sharma for her tremendous care and expertise during my entire delivery process. She has that special magic to make her patients feel incredible. She had been a super guide during my entire journey at Apollo Cradle. She attended me and answered all the queries with immense patience. All thanks and cheers! to Apollo Cradle team for making my pregnancy a smoother one. We came to Apollo Cradle in first week of Jan with our delivery around the corner. Our first entry itself put us at ease, and we were sure this is the best place for our baby’s delivery. The management included the dietician and physiotherapist, who were extremely helpful and available whenever required. After having a LSCS delivery, I was scared that I will take time to start my movement but all thanks to Dr. Chandrakanta, I was on my toes the very next day of delivery Our baby girl was in NICU for 5 days and she came to us after doctors were fully sure of her good health conditions Thanks Apollo Cradle and Dr. Seema for a wonderful experience and giving us the joy of parenthood.